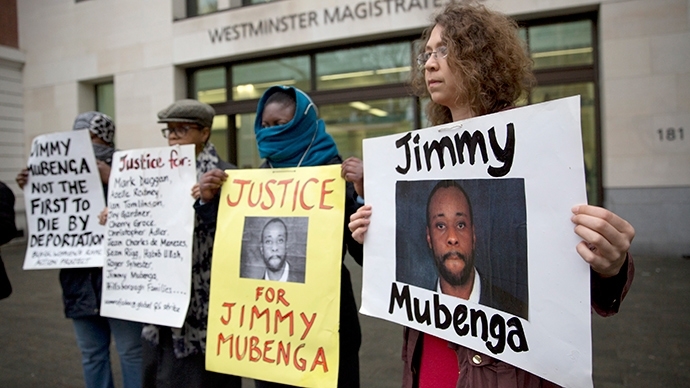 In 2013 an inquest found that Jimmy Mubenga was “unlawfully killed” while being “escorted” by G4S guards on a forced deportation flight to Angola in October 2010. On December 16th 2014 these G4S guards were found not guilty of manslaughter. Immediately after the trial it emerged that the judge had ruled as “inadmissible” evidence pointing to endemic racism within G4S. 76 racist texts had been found on the phones of two of the G4S guards “escorting” Jimmy Mubenga on the deportation flight. Clare Sambrook of Open Democracy (who had been ordered to remove certain website articles critical of G4S during the trial) looks at this issue here. 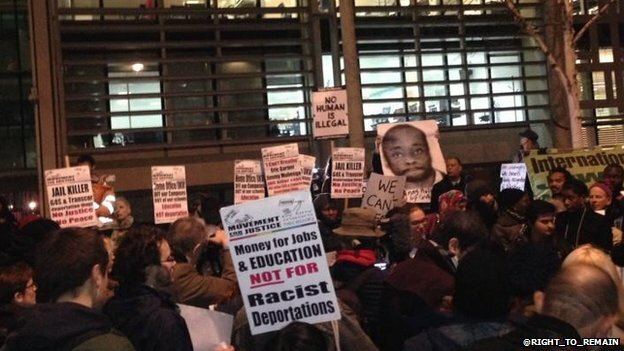 Around 200 people protested on December 18th International Migrants Day outside the Home Office in London demanding justice for Jimmy. Protesters called. 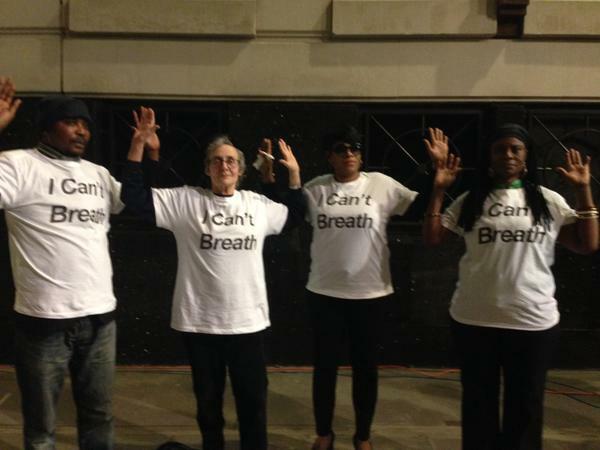 “We can’t breathe”, echoing the last words of both Jimmy and of Eric Garner who was killed by police in New York recently. The protest finished with an impromptu march to the nearby headquarters of G4S. 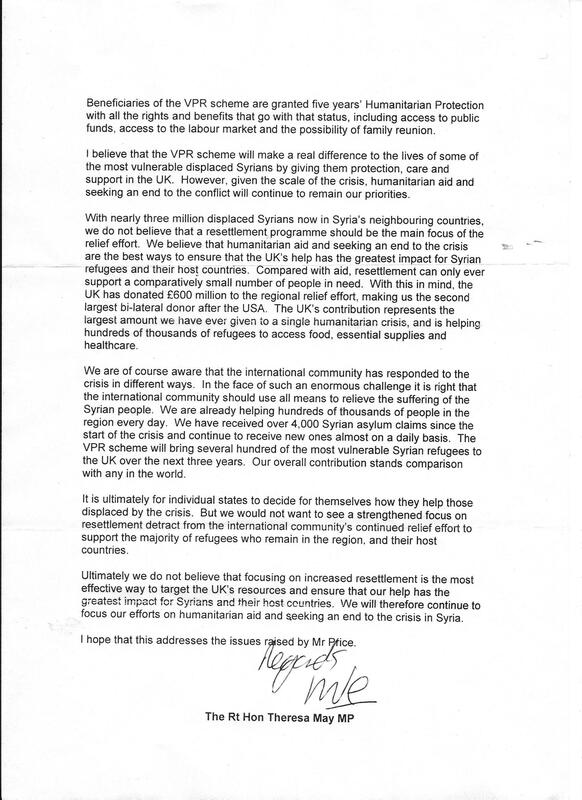 The UK and Syrian Refugees: in the ‘proud tradition’? 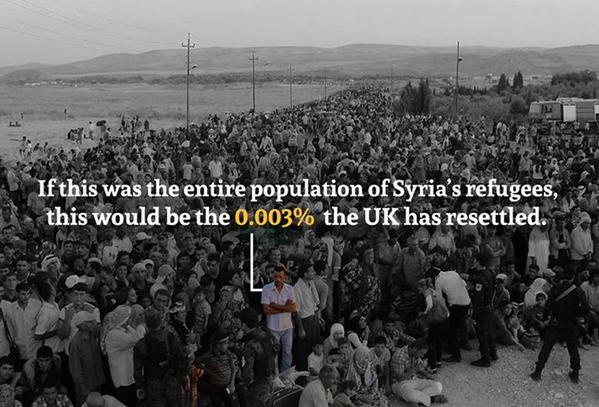 The total number of Syrian refugees resettled in the UK could fit on a bus. So far the UK has resettled 90 refugees from the biggest refugee crisis since World War Two. 28,500 (85%) of these resettled refugees will be in Germany. The UK has said it will take “hundreds” over “the next three years”. Moldova, Europe’s poorest, country has resettled 50. It’s difficult to comprehend the scale of this refugee crisis and what it means for those people forced to leave their homes. If a refugee crisis of this scale happened in the UK it would mean 30 million people on the move. As a useful BBC report comparing the UK to Syria pointed out, the numbers of people leaving the UK would be equivalent to the emptying of the entire populations of Greater Manchester, Tyne and Wear, Merseyside, Glasgow and half of Greater London and their exit from the UK. You can hear this report here. Syrian community organisations in the UK and Syrian people seeking asylum have protested urging European countries – and the UK in particular – to resettle more Syrians. 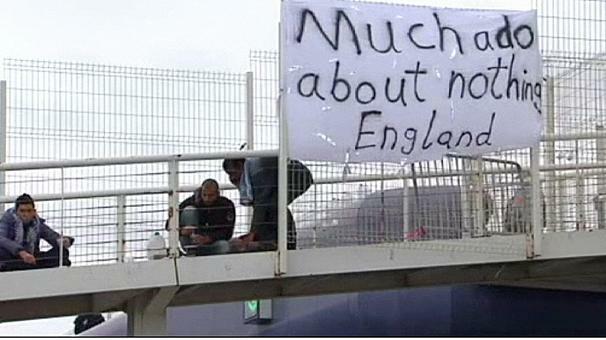 There have been several protests in Leeds at the Waterside Home Office Immigration Reporting Centre and regional HQ. SYMAAG organised a meeting with speakers from the Syrian Association of Yorkshire and Refugee Council in Sheffield in August which unanimously backed a resolution to resettle Syrian refugees calling for the resettlement of “several thousand” Syrian refugees and for South Yorkshire councils to play their part. 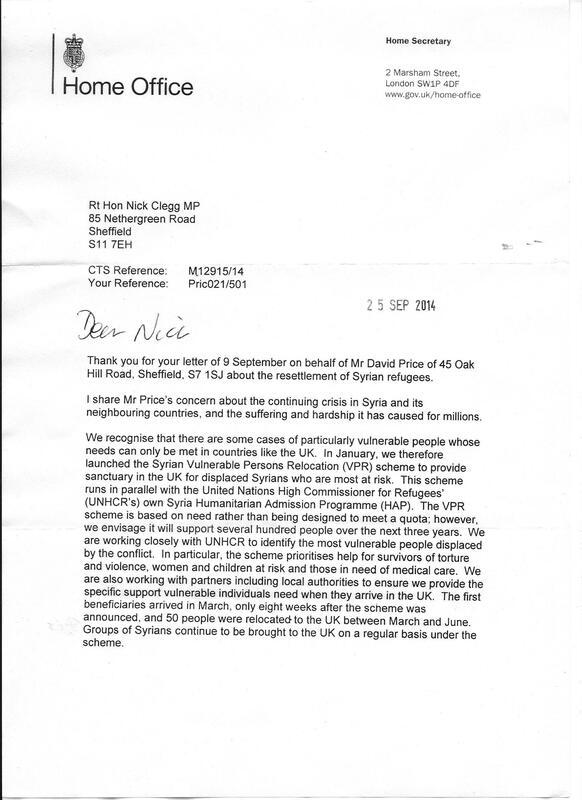 At a local level a war of words between Sheffield City Council and Sheffield MP/Deputy Prime Minister Nick Clegg has gone on since April this year, each accusing the other of refusing to resettle Syrian refugees. Meanwhile – and despite Sheffield’s status as a City of Sanctuary – the City Council has not resettled one Syrian refugee as of December 2014. Many refugees and campaigners suspect that the prospect of this changing becomes more unlikely as the General Election in May 2015 approaches and the parties compete to look “tough on immigration”. 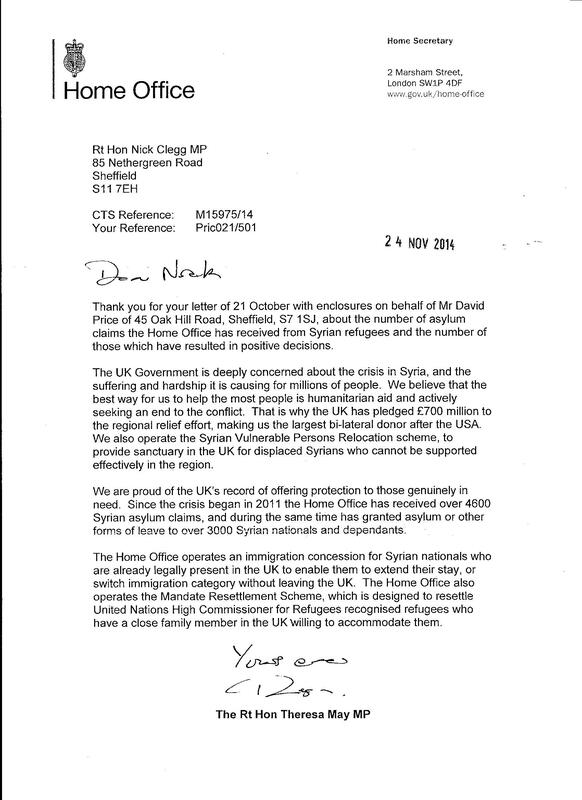 We hope we are wrong and continue to urge South Yorkshire councils to accept Syrian refugees as other councils, like Glasgow, have. At a parliamentary debate on resettlement of Syrian refugees called by Labour on Wednesday 10th December there was much talk – from Government and opposition – of Britain’s “proud tradition” of welcoming refugees but no commitment to resettling Syrian refugees. Commenting on the debate the Refugee Council remarked “We are not proud; we are ashamed at the scale of Britain’s woefully inadequate resettlement scheme”. Where is this “proud tradition”? Where are these “Cities of Sanctuary”?